Transport for London, the British Transport Police and the Mayor of London today this week unveiled a compelling new video about sexual harassment on public transport, featuring the disheartening statistic that 90% of incidents go unreported. 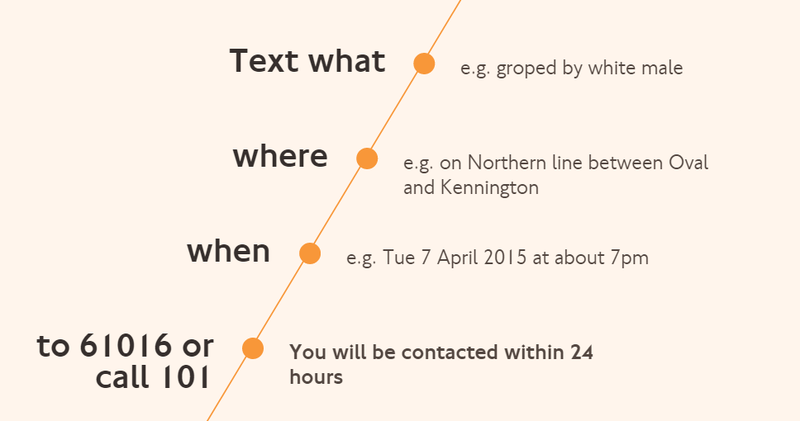 The video shows increasing levels of harassment on a tube journey, and asks at each one whether you’d report it yet. How bad does it have to be? If you’re not entirely sure the man touched your backside on purpose, would you report it? If you thought his creepy comment was well-intended, would you report it? I and countless other women have experienced incidents like these and left them unreported. In my case, I couldn’t be 100% certain which man on my packed Central Line train had touched me, and I didn’t want the hassle. If I’d known then that I could text the British Transport Police about anything that made me feel uncomfortable, I would have. I also would have when a man intentionally followed me all the way through the tube station, stood right next to me at the very end of a deserted platform and declared he “wanted to know everything about me.” That definitely made me uncomfortable. And I also would have reported the man I saw take a sneaky photo of a woman from behind as she stood in the aisle of a crowded train. Instead I glared at him, which did absolutely nothing. You don’t have to prove that it was a criminal offence or intentional to report it, we can investigate that for you. No incident is too small or trivial. You will always be believed and you will always be taken seriously. Save 61016 to your phone now. We hope you never need it. With thanks to The Pool for the heads up.